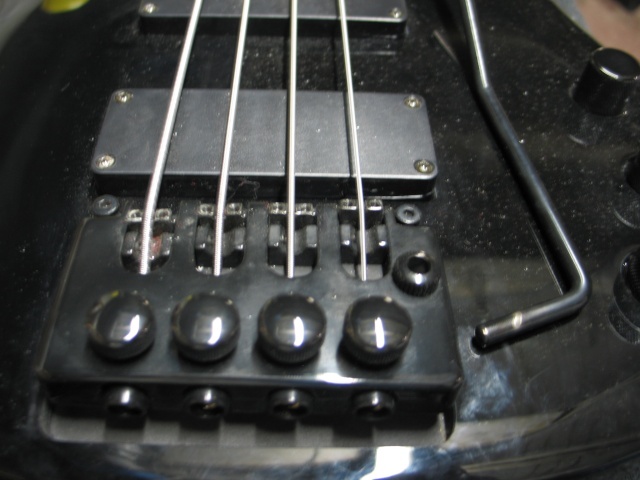 i'm really surprised, us being the "trem experts" and all, that none of us have had THIS bass. i mean, the majority of us prefer the kahler trem ... its user friendly, easier to install, reasonably affordable and it works. we haven't had any hipshot-ers here (or at least that i know of). i wouldnt want to install one of those! holey smokes. and although we are kahler oriented, some of us fantasize about the trans trems and ritter system. but this trem system goes under the radar. there are no aftermarket trems or parts. the company isnt forthcoming about who manufactures it (rumor has it that its some russian speaking eastern european country's company (where bearded women run the machinery that make the trem parts )). the company doesn't even produce this bass anymore ... or offer any customer service (or answers) to anyone who has one (me). so even tho i'm out of work and going into debt, one appeared at a decent price. i decided i shud do what i can to get it because i might not have the chance to own one again. i also made the decision that i may be living on ramen noodles for breakfast lunch and dinner for the next few weeks. but i got it! this thing doesnt even have a model number. my other washburns are tarus t-24 and a b-2. this one is just called a bantam with a trem. surprisingly for a bass that sold new for under $400 ... this is a real nice trem. its motion is very smooth and gradual. it is more sensitive than a kahler ... you touch the back or the bar and it changes the pitch ... and thats ok. the tuning issues are non existent. downside ... it doesnt dive bomb as far as a kahler does. i also dont understand what the 4 locking knobs on the back do ... hold the strings in??? weird. the other thing that is cool is that the trem arm isnt threaded into the trem, its a press fit and i think a teflon ring on the inside that snaps the arm in to the base and also hold the arm in a position in the rotation ... so its not just hanging there. aside from the trem ... its a mediocre bass. i wouldnt buy one if it didnt have a trem on it. the preamp doesnt have much kick to it and the humbuckers are kind of lacking character. 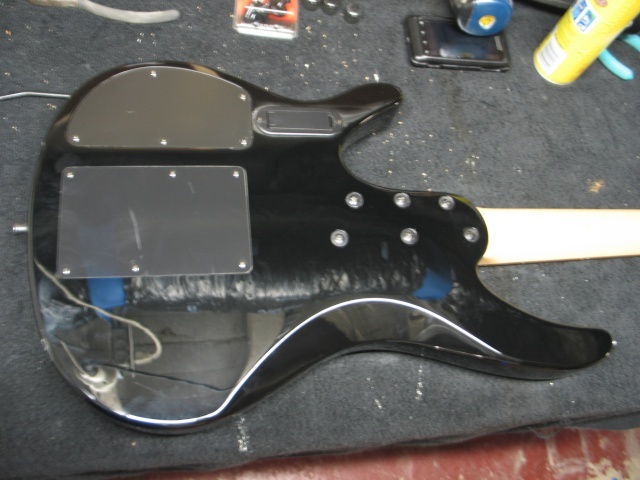 electronics are first ... preamp with some overwound humbuckers to make it tasty. then perhaps a refurb for a different color (because all the ones i've seen are black ... i want blue, or lime, or mustard or metal flake gray) and redoing the neck, roll it, dress the frets, etc. etc. etc. That is a Bach music tremolo.. I have a chrome one for a project i am planning. What? No website? No company info? No reason why washburn used their trem? The website adress for bach music is posted on this forum under "other brands"
I dont know why Washburn stopped using them. thanks hans ... that answers a few of my questions. i dont know why they stopped either, but i suspected that they started because this is a decent trem @ $130 usd. but how good are those trems? gimmie tues and wed nights to use it at practice and i'll post a review. initially, the A and E strings are tuff to fish thru the backside to the front when restringing. 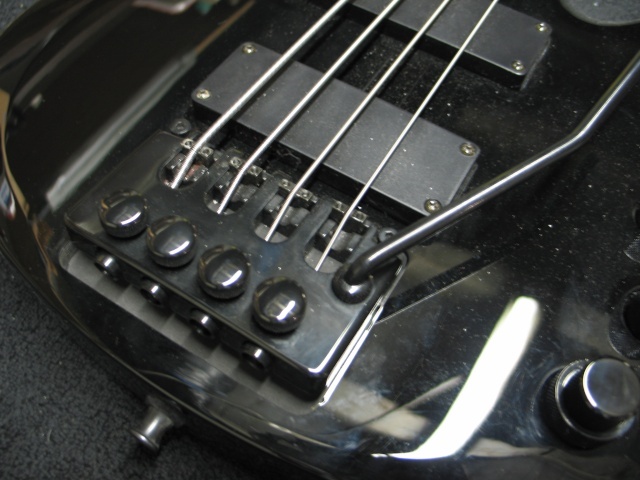 see the little flakes of metal on the bass in that one picture? thats from pulling the rotosounds thru it. i dont see how the knobs on top are fine tuners. i just got them torqued all the way down after i got the strings on ... i'll have to fiddle with it. the whole unit and the bass stays in tune really well. i'm gonna rip the whole bass apart tomorrow, clean it, service it and re-set everything back up .... its playing like a 2X4. They are a Czech republic company. I imagine these would be pretty cheap. I know a guy who deals / distributes with them from the Netherlands - ships to the US. i think because this company does most of its business outside of the czech republic, they accept euros instead of krowns. like i said ... $128 USD. (+ shipping of course (arm and a leg)). In fact the trem would cost 212 euros, not sure it's worth the hassle. Yep, Hans and BD nailed it. Definitely a Bach Musik bass trem. Great score, MadMike! Let us know how well it works after you rip it all apart. I've had my eye on one of those for a long time, since I want to combine it with a locking nut one day. noob ... whats your currency? what country is melot in? i did the conversion from euros to u.s. of a. dollar bills and this thing is cheap. did you do your conversion right? as we are currently in the middle of yard work, putting up beaded board and painting the living room / dining room, setting up the man office (my testosterone man cave), painting the bathroom, trying to find a job and breaking in a new drummer ... plus, i'm gonna break the ironbird down first ... it may be several weeks till i get to it. i get so gung-ho and talk a lot of baloney sometimes, but when it gets down to it ... theres only so many hours in the day. i finally shipped mike's series 10 back to him today. that took 10 days longer than i expected. it took me all day to take inventory of all the bass parts i'm not gonna use, all the extra speakers, corners, grills, handles, pre amps and crossovers, take pictures of them all, and post them on CL and e bay. amy was bumming because i didnt get any spackeling done today. but when i get to it i will def keep everyone in the loop. ... and i think i found a job today. Pre amps??? Did you say PRE AMPS??? OK, I probably can't afford them anyways! No worries, Bro. Life does what it does, so you do what you need to in order to get by. Whenever you get the chance, let us know what you think of the trem. Yeah ..... the pre amp I have left is the art tps II, 2 channel, multi instrument tube preamp. I used it for two months ... didn't have the "tube mid growl" I was hoping for. On CL for $80. Message me if your interested and ill cut you a deal cuz youde have to pick up the shipping too. If it had a EQ I'd buy it. 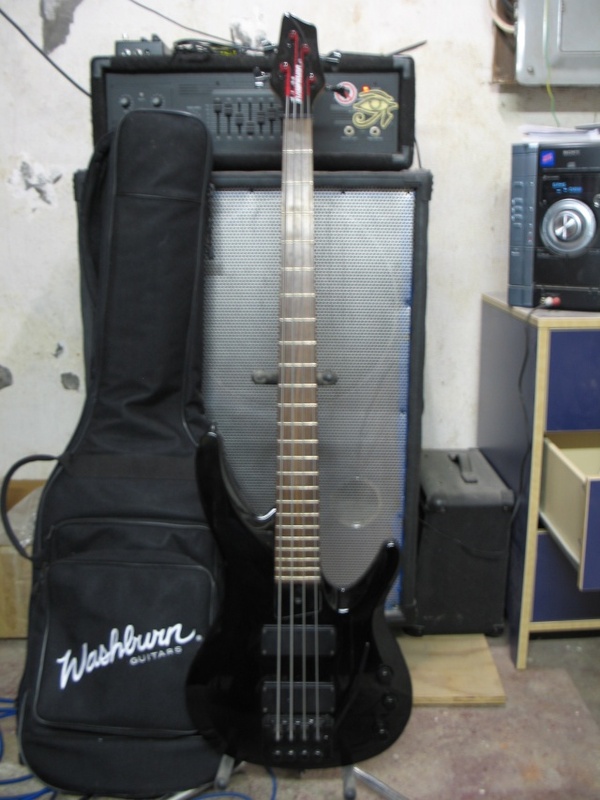 I'd swap out my Washburn EQ/pre. Yeah....gotta agree with Mike. Thank you for the great offer MadMike, but I would also miss the EQ. Still, those things retail new for almost $200, so someone should snag that thing soon at your price. it's 212 Euro with shipping. You can put America for the shipping and it automatically charge you around 212 euro's for the trem and the shipping. Played this bass tonite at practice. Played it before and put it down because I didn't like the tone but it wasn't the bass ... one of my speakers was shorting. Fixed the speaker last week and thought ide give it a good run thru with this bass. My 2nd favorite bass now. This one doesn't have the attack or "ping" like my tarus or custom do, but has a very balanced level and tone with all the layers, filters and effects I use ... makes it very easy to use. And very easy to play ... although its not super fast. Maybe just taking some getting used to. Hard to get in tune ... but stayed in tune all night. Subject: Re: serious new trem content!